Discover the history of the American circus through special exhibitions, displays and interactive galleries. With over 44,000-pieces, the Howard Bros. Circus Model recreates the experience that’s entertained children of all ages for more than 200 years. The bearded woman, the birdlady and the human pincushion are all part of the must-be-seen-to-be believed sideshow exhibition. Don’t run away to the circus. The interactive galleries bring the circus to life by making children of all ages part of the big show. Like other titans of his times, John Ringling had his own luxurious private railroad car in which he traveled the country. See it here. The costumes, the clowns, the posters, the props, the wagons, all come alive to take you away to the Big Top. The Ringling Archives are located in the Circus Museum's Tibbals Learning Center. 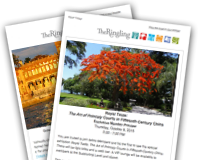 The Archives includes the Ringling Collection, John Ringling's Papers and the Circus Collection. The Circus Collection contains records, manuscripts and papers of the American circus. Friends of Asian Art connect with other members with an interest in the arts of China, Japan, Korea and South and Southeast Asia. Events are held exclusively for the Friends including exhibition viewings, guest lectures and examination of artworks represented in the Asian art collections.